In March of 2002 Gail Sirna of Rochester Michigan became the 21st person to present the results of her Honors research under the auspices of the National Academy of Needlearts. The topic of her research is paintings or other artworks which depict women (and sometimes men) sewing, embroidering, knitting, crocheting, weaving, spinning, or making lace. The topic presented itself when Gail was creating another slide presentation that explored the depiction of the human form in needlework, i.e., embroideries or needlepoints of people. Gail decided to introduce this presentation with a few slides of paintings of people stitching (since this slide presentation was directed at needlework groups). She looked for maybe 5 to 10 paintings and in short order had discovered perhaps 50, with little effort. Soon the second topic became more fascinating than the first. 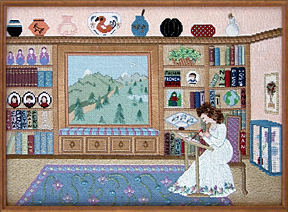 Gail continued, on a casual basis, to look for artworks that depicted the needleworker. She looked in museums and catalogs and datebooks and address books, on posters and greeting cards, and even mugs and mousepads. Sometime along the way Gail decided to make her quest more formal and systematic. She enrolled in NAN’s Honors Program and her research became much more academic. She visited numerous museums (over 30), purchased a huge number of books (well over 50), spent weeks on Web sites, and untold hours corresponding with museums. The results were the identification of over 400 artworks that depict the needleworker. A huge preponderance of the paintings which portray an embroiderer were done by the Impressionists, including the famous ones from France and lesser known artists from the United States, England, and Denmark. Renoir and Cassatt particularly produced an impressive number of portraits of women stitching; no doubt because both concentrated on portraiture or genre paintings rather than other disciplines such a landscapes, cityscapes or still lifes. However, the predominant reason for the great number of stitcher paintings among the nineteenth century artists is that the nineteenth century woman on both sides of the Atlantic was expected to be an accomplished needlewoman. Proficiency in all forms of needlework, both plain and fancy was the hallmark of the virtuous and industrious woman. Other artists also portrayed the embroiderer; particularly notable are the genre paintings of 17th century Holland which sought to imbue the peasant with dignity and sympathy. But throughout the past 500 years there is always evidence of the needlewoman found in art. One is a Lladro figurine entitled The Embroiderer. A second is another figurine called Carol; this figurine is by Royal Doulton. While visiting Ecuador Gail discovered an artwork by a Ecuadoran artists Olga Fisch. 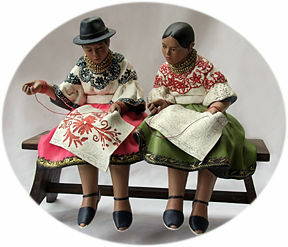 This sculpture depicts two native women seated on a bench; one woman is teaching the other one to embroiderer. This is a favorite keepsake because it really expresses the essence of what NAN is all about sharing one’s love of needlework. 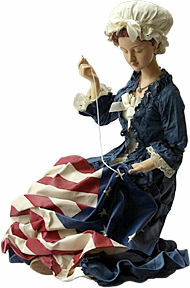 Another recently acquired “stitcher” is the fabric maché Betsy Ross by Clothiques. In addition to the written dissertation NAN requests that the Honors candidate stitch a piece that reflects in someway her research, and to present it to NAN for inclusion in its permanent collection.. Gail stitched the above self portrait entitled Moi-même. Later Gail published a beautiful book based on her research. Its title is the same as her Honors these: In Praise of the Needlewoman, subtitled Embroiderers, Knitters, lacemakers, and Weavers in Art.